Islam (Submission) was powered by the revelation of the Quran in the early 7th century to guide humanity in a right direction for its disgrace and deviation, and was co-powered by the unveiling of its mathematical coding in the late 20th century to address the infiltration of corruptions and misconceptions into practices of Islam over the period of time. Thus, the Quran and its mathematical coding are two distinct divine messages destined to reveal for two different guidance periods as mercy and reminder for its people. The Quran was revealed more than 1400 years ago while the mathematical coding of Quran is around us about half a century but has not got much attention of many people even of those who believe in the Quran. Their leaders disregard it claiming that Muhammad was the last messenger (which is not true) as well as saying that they do not need it and continue with their corrupt beliefs and practices to make them and their blind followers losers in the Hereafter. They fail to realize that the message from God is a gift from Him for humanity to find the right way for them required for its disgrace and deviation while they ignore the reminder in the message that it will strengthen their faith. This review may help the true believers of God and the Quran to accept the message sent with the prophesized messenger (messenger of covenant) knowing details about the message and the miracle given to him being the basis of recognizing someone whether he is a messenger of God or a false claimant. Note: Here is a hint of 19 to be the code of the Quran as well as a prophetic sign for the messenger chosen to unveil the mathematical coding of Quran. [74:31] And we made the angels to be guardians of Hell, and we did not make their number except: (1) to warn the disbelievers, (2) to make certain for those who were given the scripture (Jews aNote: This is an explicit proof of a messenger (44:13) sent with the reminder (74:31), the mathematical coding of Quran, being connected with the Arabic word, dhik’raa in the feminine form but most people rejected him as they found him astray and invented foolishness in him.nd Christians), (3) to strengthen the faith of those who believe (Muslims), and (4) to eliminate any doubt from those who were given the scripture (Jews and Christians) and the believers (Muslims). And that those who have disease in their hearts (hypocrites) as well as the disbelievers would say, “What did God mean by this allegory?” Thus, God misguides whomever he wills and He guides whomever He wills. None knows your Lord’s soldiers except He. And it (hiya) is but a reminder (dhikraa) for the humans. Note: Both it (hiya) and a reminder (dhik’raa) in the last phrase of the verse are in the feminine form. According to the basic Arabic grammar rule, masculinity is by default and for femininity, it has to be something special to reflect this gender, and the reminder indicates the mathematical coding of Quran being distinct from the Quran, a reminder in the masculine form. Note: This is an oath of God consisting of 3 elements to strengthen our hearts to reflect on the sign and the reminder. Note: The 19 is confirmed to be a sign (miracle) for the messenger followed by an oath of God and the sum of the digits of sura and verse # i.e. 74:35 is 19 [7 + 4 + 3 + 5]. Note: The reminder (message) mentioned in 74:31 is a warning, which will be either accepted or rejected by the people when it comes to them is also affirmed followed by the oath of God while the consequences are detailed out in the subsequent verses of the sura. 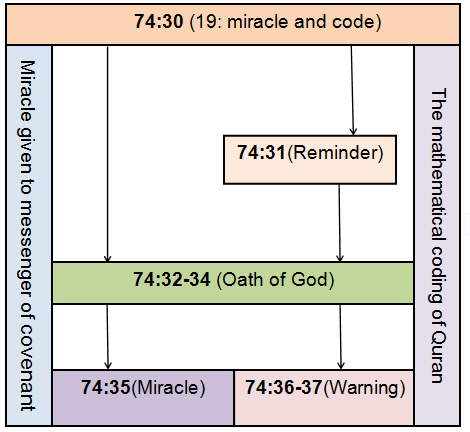 In the illustration, the precise message consisting of 5 components found in 8 verses of sura 74 connected with the left and right down arrows depicts the miracle and the message given to the messenger affirmed followed by an oath of God being the miracle embedded in the message while 19 is a miracle as well as the common denominator of the mathematical coding of Quran. Note: This is not only an explicit proof of both the message and the sign (miracle) given to the messenger precisely coded in a specific set of verses in the Quran but also an exact answer for the common question of many Muslims who ignore the divine message saying that if the messenger has come to us what is the message sent with him. Note: The hint of mathematical coding of Quran, the number 19 being the code (common denominator) and the sign (miracle) to support the messenger. [27:82] When the punishment is almost due against them, we will produce for them a creature from the earth speaking to them that the people are not certain about our revelations. Noah, Abraham, Moses, and Jesus the son of Mary. And we took from them a solemn covenant. Note: This mathematical conformation is an explicit proof of the messenger sent with the message supported with the number 19 followed by the fulfillment of the related prophecies is destined to purify the reminder as well as the religious practices in the event of their distortions. [74:30] Over it (‘alayhaa) is nineteen (tis’ata ‘ashara). Note: A hint of 19-based mathematical coding of the Quran as well as a sign for the messenger who has been chosen by God to unveil the mathematical coding of the Quran. [81:15] That I swear by the galaxies. [81:16] They run in their orbits. [81:17] And the night when it passes. [81:18] And the morning when it breathes. Note: This is an oath of God consisting of 4 statements and should not be confused to be statements of a human messenger. [81:19] Indeed, this is an utterance of an honorable messenger. [81:20] Powered (dheequwwatin) by Possessor of the established Throne. [81:21] He shall be obeyed being trustworthy. Note: Here is a confirmation that the Quran is delivered through an honorable messenger who shall be obeyed and trusted, which means that it must be read, understood and followed. [81:22] And your friend (Rashad) is not crazy. [81:23] And he saw him in the high horizon. Note: Here is a prediction in the Quran during its revelation that the messenger of covenant to be taken to the high horizon to support his messengership. [81:24] And he is not a withholder of the future. [81:25] And this is not an utterance of a rejected Satan. Note: There is no falsehood in the Quran as it is not an utterance of a rejected Satan followed by an oath of God. [29:51] Is it not enough for them that we sent down to you (Muhammad) the scripture, which is recited to them? In that (Quran), there is indeed, a mercy (la-rahmatan) and a reminder (wa-dhik’raa) for a people who believe. Note: The statement in the verse, 29:51 is a response to the miracle demanded by the wicked in the previous verses that they wished to see it to come down with the prophet, wherein there is an indication of the mathematical coding of Quran being a mercy and a reminder for a people who believe what we witness after 1400 years of the revelation of the Quran. Note: The prophecy in the Quran to produce a creature from the earth for authenticity of the Quran to bring people back to God’s revelations when the majority people are away from His revelations. Note: This mathematical conformation is an explicit proof of the messenger supported with the number 19 followed by the fulfillment of the related prophecies saw him in the high horizon to strengthen our hearts to believe him as a messenger to accept the reminder sent with him. [44:12] “Our Lord, relieve this retribution for us; we are believers”. [74:31] And we made the angels to be guardians of Hell, and we did not make their number except: (1) to warn the disbelievers, (2) to make certain for those who were given the scripture (Jews and Christians), (3) to strengthen the faith of those who believe (Muslims), and (4) to eliminate any doubt from those who were given the scripture (Jews and Christians) and the believers (Muslims). And that those who have disease in their hearts (hypocrites) as well as the disbelievers would say, “What did God mean by this allegory?” Thus, God misguides whomever he wills and He guides whomever He wills. None knows your Lord’s soldiers except He. And it (hiya) is but a reminder (dhikraa) for the humans. Note: This is an explicit proof of a messenger (44:13) sent with the reminder (74:31), the mathematical coding of Quran, being connected with the Arabic word, dhik’raa in the feminine form but most people rejected him as they found him astray and invented foolishness in him. Review and inquiry of 31 verses across 8 suras in the Quran provides us enough evidences to believe that the Quran and its mathematical coding are two distinct divine messages destined to reveal for two different guidance periods. The mathematical coding of Quran was unveiled in 1974 through fulfillment of the related divine prophecies and promise to address the infiltration of misconceptions and corruptions occurred around the beliefs and practices of Islam over the period of time bringing people back to God’s revelations. But it is unfortunate that the majority fail to reflect that the divine message is a gift for humanity to find the right way to practice His religion to be rewarded by Him and the one way journey to meet their Lord. And the so called Islamic scholars ignore it claiming Muhammad to be the last messenger, which is an erroneous claim as well as saying that they do not need it and continue with their corrupt beliefs and practices to make them and their blind followers losers in the Hereafter to suffer the retribution. We are blessed to have explicit proofs of the messenger from the detailed of 3 critical contexts and of the message including the miracle given to the messenger from the detailed and illustration of 8 verses in sura 74 is a befitting way for the generation we live now. Hence, there is no way for those who trust God and have certainty in the Hereafter to disregard the mathematical coding of Quran given as mercy and reminder just to stay with the majority or out of jealousy or being ignorant or arrogant while those who turn away from this reminder sent with the messenger will say “Our Lord, relieve this retribution for us; we are believers” when they see the retribution.